When viewers watch couples choosing between properties on HGTV’s “Lakefront Home Search” series, the docks that accompany those homes are often little more than seasonal narrow metal catwalks suitable for temporary tie-up of a rowboat or outboard fishing skiff. It’s altogether different at Smith Mountain Lake, where boat use can be year-round and docks are significant construction projects that begin at about $60,000 to $80,000 and range well upward. Here, docks are used as outdoor living and entertaining spaces—suitable for keeping expensive boats, PWCs and myriad water toys, secure, but (ideally!) also able to accommodate a vacation onslaught of grandkids and their friends or a neighborhood sunset cocktail hour. 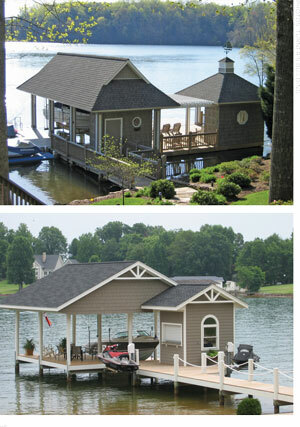 That mix of desired dock functionality, say dock builders, presents a real dilemma: the 1500 square foot AEP “footprint” allowance (which includes roof and decking overhangs, floaters, mounted PWC racks or drive-ons and walkways wider than six feet) on lots with 100 to 300 feet of shoreline requires significant trade-offs in dock space utilization. 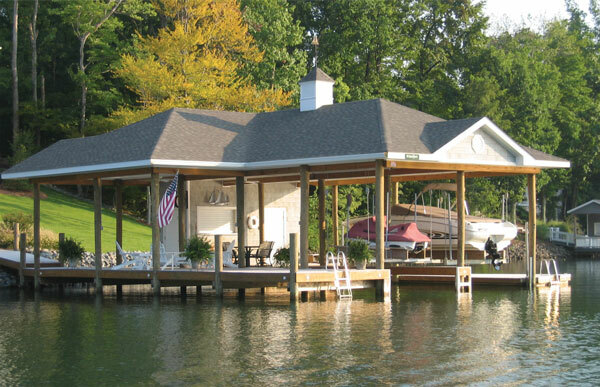 Turner strongly recommends that anyone not experienced in “dock life” arrange to visit several different dock designs and talk with owners about how they use their docks, what they like and what they would change. “Only then can those customers make educated decisions about dock space utilization,” he says. AEP rules also limit dock house or storage enclosure size to 72 square feet, which requires clever design for storage of requisite dock-house “stuff.” Many who are building or remodeling integrate a bar pass-through and roll-up window into one side, says Erik Plyer, of Plyler Homes and Docks. “Any more, granite is the go-to bar surface because it is essentially maintenance-free,” he says. In fact, low maintenance is generally in high demand for docks. “Composite decking (like Trex) or PVC (like Azek) is more expensive, but doesn’t warp, splinter or need staining. And newer products— especially the PVCs—aren’t prone to unsightly mold and mildew,” Plyer notes. 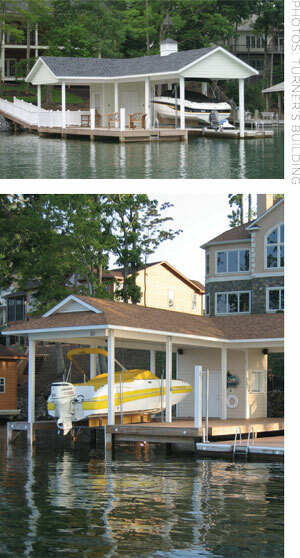 Dock remodelers, Plyler adds, often replace decaying wooden decking with maintenance-free manmade planks. They install plywood or vinyl bead board ceilings which brighten undercover spaces, create attic storage space and dramatically decrease the mess that rafter-dwelling spiders and birds drop on fiberglass and canvas. Some add steps—which AEP does not count as additional square footage—for easy water access by kids, pets and seniors. 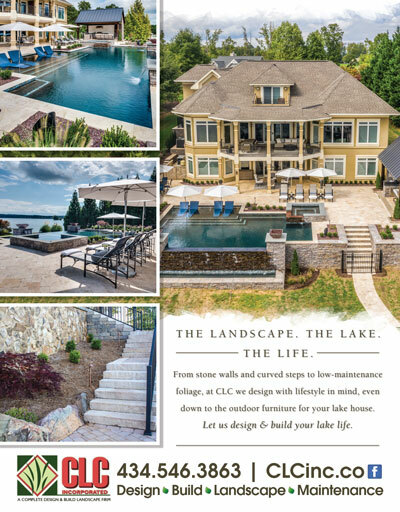 “And because the Shoreline Management rules won’t allow for dock expansion in most cases, we’re often creating lounging and entertaining space by decking over all or part of an older dock’s second slip,” he explains. Other common upgrades Plyler lists are installing remote-control boat lifts, cradle modifications for newly-purchased tritoons (which have a third tube beneath the hull and are usually are larger and heavier than pontoons) and pull-down steps for attic storage of lake-life gear that is not frequently used. A weather-proof dock box provides handy out-of-view storage for waterfun paraphernalia like skis, life jackets, noodles and other toys. Avoid mildew and rot by putting things away dry or leaving the lid up until drying has occurred. Experienced “dock dwellers” know that installing a layer of indoor-outdoor carpeting on dock floaters helps protect the boards from beating sun and feet from the burning boards, improves footing, and reduces splinter injuries when the boards are real wood. Using yellow bulbs in your lighting plan will draw far fewer bugs, and low-cost home-store rope lighting overhead is a simple way to create a warm glow. A hammock hung between dock pilings makes a great shady spot for a nap or summer read, while a wireless speaker allows the playlist from anyone’s device to provide a musical backdrop for all the waterfront action. One final suggestion that’s key to safely enjoying your dock life: post a “House Rule” that requires kids to wear life jackets whenever they are on the dock or in the boat. It’s your dock, you make the rules, and this one is a prudent way to make sure kids stay safe.